Children are always fascinated by volcanoes. When Mt. St Helens recently erupted again in 2004, the children couldn't stop talking about it. This unit was created to motivate children to read, write, as well as be more engaged in the other curriculum areas through a variety of hands on activities. This unit is a comprehensive learning experience. It not only teaches the children about the subject matter but it is a motivator to children who have difficulty learning the basic academics. The unit first teaches the children how to do research. The unit teaches the children to work corporatively in small groups. It gives them the opportunity to work on their writing skills and to exercise speaking in front of a group. The project allowed the children to exercise their creative artistic abilities as well. The ultimate goal was achieved when the film was shown to other children and adults. The children whose self esteem was low had been raised to a new level. There are three major hands-on activities in this unit. In the first activity the children construct different kinds of volcanoes out of clay. In the second activity the children simulate an eruption of a volcano through an experiment. In the third activity the children make a movie incorporating what they have learned about volcanoes into an instructional film. 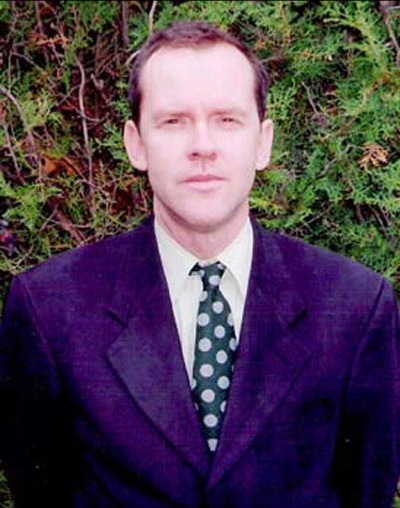 Bruce Wilson has been teaching special education for the past 18 years. He currently teaches fifth grade learning disabled students at Public school 84 in Williamsburg, Brooklyn. He enjoys working on movie projects with his students. In his spare time he enjoys traveling and photography. Materials: Computers with Internet access, Apple iMovie software, volcano-building materials, mini-books.  Use the internet to gather information.  Understand the cause and effect of a volcanic eruption.  Conduct an experiment and record and analyze data.  Utilize technology through the medium of film to educate others.  retell an event in sequence. Pompeii, The Day a City was Buried by Melanie and Christopher Rice. 1 . Discuss with the children what they already know about volcanoes. Make a language experience chart. Go to the following web page: http://unitedstreaming.com. Show students the film " Volcanoes of Fire." 2. Give out the volcano mini-book . It is the pamphlet from http://crayola.com and read it with the students. Go over the vocabulary words. The students may color the labeled diagrams of the volcano. 3. Give the students more time to explore the web site http://volcano.und.nodak.edu. Library books on volcanoes can be available too. ( see list ). Look for articles on recent eruptions through newspaper archives on the Internet. Take one mini-book and increase the size of the pamphlet on a copier (poster size) of the three pages. Cover the words that label the parts of the volcano. Have the students come up to the front of the room and label the parts. 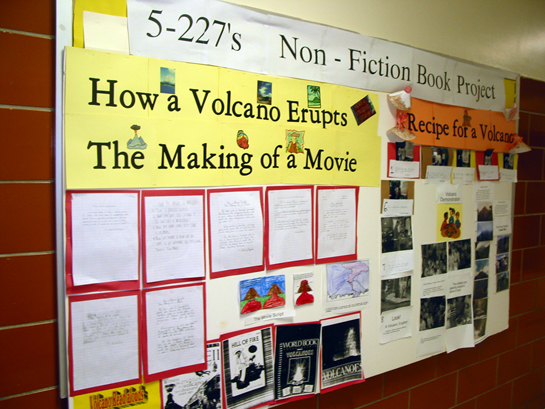 Students can give book reports on the volcano books as well.  Be able to work together effectively to create a specific kind of volcano. 2. After the students view the short film break up the class into three groups. Write the words composite, shield and cone on index cards. Let each group choose a card. The group will then have to construct that type of volcano. Make sure each group is sure of what features distinguishes their type of volcano. Have each group make a checklist from the definition of what makes up their kind of volcano. Let the students check out each others' volcanoes to see if it fits the criteria. 2. Successfully follow the sequence of steps in the experiment to show the simulated eruption. baking soda, vinegar, red or orange food coloring, water, measuring cups, tablespoons, washing detergent, tissue. 2. Before the experiment, the teacher reviews the units of measurement and has the children practice measuring out the ingredients. 3. The children break up into two groups. One group reads the recipe for the volcano recipe exactly as written. The other group uses estimations rather than using the measurement tools. 4. Students complete a worksheet and report their results. 1. Retell the volcano eruption through a series of student-drawn diagrams. 2. Help construct a storyboard of the "Volcano Recipe." 3. Perform the retelling sequence of the eruption and volcano recipe in front of a movie camera. 4. Assist in the editing of the volcano movie. 1. The students will work together in making a storyboard for the storyline for the movie. 2. Students take photos with the digital camera of each step in the volcano recipe. 3. Each child who has participated in the experiment is to recite his or part in the movie. 4. Other children are assigned jobs in setting up the set, assisting the teacher in filming, and holding cue cards when needed. 5. The children practice their parts for the film for one to two days (45 minutes each day). The dialogue is very short so students will not have much to memorize. Cue cards are used for those who have difficulty. 6 It is important that the film is recorded in the correct sequence so students can comprehend the whole process. 8. The movie can be shown to other classes through out the school as an instructional film. It can also be showcased along with a bulletin board on the making of the film during parent teacher conferences. Have the students write an essay on what they enjoyed about in making the movie. 1. Students will read and comprehend informational materials. 2. Students will prepare and deliver an individual presentation. 3. Students will examine, describe, investigate and measure the effects of natural events such as volcanoes.